The title is a quotation from Shakespeare’s Sonnet 73 in which he compares his winter mood to ‘Bare ruin’d choirs where late the sweet birds sang.’ Since Empson’s Seven Types of Ambiguity this has usually been taken to refer to the remains of the abbeys which were dissolved under Henry VIII and which had mostly fallen into ruin by his time, the stone having been removed for building. The singing of the sweet birds relates to the plainer style, setting English not Latin words, which had replaced the ‘late’ (former) elaborate polyphony of the earlier half of the sixteenth century. The interpretation is not universally accepted - some prefer to regard the image as one of avenues of leafless trees in winter - and, indeed, given the richness of Shakespeare’s imagery it’s possible that he wanted to evoke both images. As a peg on which to hang a short selection of Latin-texted music from the latter half of the century, however, it will serve very nicely. About William Byrd’s loyalty to the Roman church there can be no doubt, though his beliefs appear to have been tolerated at court, where he composed in English and Latin for Queen Elizabeth’s Chapel Royal. The tenor of the two texts which are included here - how shall we sing the Lord’s song in a strange land? and part of the Lamentations of Jeremiah, bewailing the fate that has overtaken Jerusalem - shows how much he regretted what had been lost. There is, indeed, a series of settings by Byrd and his Catholic contemporaries that seems to have been intended as a kind of dialogue, often on the theme of loss. These collaborations with Palestrina, Victoria, Peter Philips and Giovanni Gabrieli are included on a valuable and inexpensive recording from King’s College Cambridge, directed by David Willcocks (Classics for Pleasure 5860482). You can obtain that King’s recording on disc for around £5 and as a download for around £3.50 and none of the items overlap with the new Linn recording; it’s a different manner of singing Byrd, but well worth having. Nor are there any overlaps between the Byrd on the new recording and another inexpensive recording which to which I would direct you as the starting point for anyone looking to begin a collection of his music: The Tallis Scholars sing William Byrd (Gimell 2-for-1 CDGIM208, containing the three masses, the Great Service and a selection of shorter works in Latin and English - see The Tallis Scholars at 30). There’s another recording which contains quomodo cantabimus? and places it specifically within the setting of Byrd’s Catholicism. On a collection entitled The caged Byrd (Chandos Chaconne CHAN0609 - see October 2008 Download Roundup) I Fagiolini pair the work with one by the continental composer Philippe de Monte. The latter sets the first part of that psalm (137): Super flumina Babylon, by the waters of Babylon we sat down and wept, to which Byrd’s setting of quomodo cantabimus? how shall we sing the Lord’s song in a strange land, may be seen as a response - the Lord’s song being the Latin Mass and the strange land Elizabeth’s England. 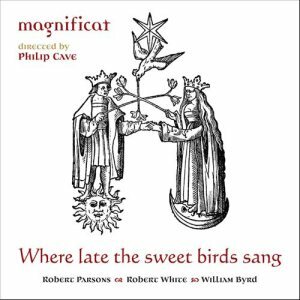 If Byrd’s Latin-texted music was mostly written for the recusant community to which he belonged, it remains something of a mystery why other composers such as Parsons and White also composed music with Latin texts. It may be that it was intended for the Chapel Royal, where the queen favoured a conservative order, or for collegiate churches where Latin was permitted if it was ‘understanded of the people’, as the Act of Uniformity puts it. There was, as the notes in the booklet point out, a Latin version of the Book of Common Prayer, intended for the universities - the Eucharist from that book is still celebrated at the start of full term in the Oxford University church - and for those parts of Wales and Ireland where English was not spoken. Thus it may well be that Parsons and White intended their music for Oxford and Cambridge, or it may just be that old habits die hard. One such habit, the performance of the Lamentations of Jeremiah at Mattins for the latter part of Holy Week, is perpetuated by the settings here of both White and Byrd. Though prescribed in the 1549 book, the 1552 and 1559 Prayer Book had moved these readings away from Holy Week. They weren’t restored until 1662 and then only at the beginning of the week. It’s unlikely then that either setting was for a liturgical context, though White’s setting could have been intended as an anthem at the end of Mattins or Evensong. Indeed, White seems to have made something of a speciality of settings of Lamentations; there are several other recordings of this 5-part set but there is also a 6-part setting (sung by Gallicantus, with other music by White on Signum SIGCD134 - review - and a setting of the lections from Lamentations for Good Friday on a recording of similar settings by Gesualdo, Palestrina and Victoria sung by Nordic Voices on Chandos Chaconne CHAN0763: Recording of the Month - review - and November 2009 Download Roundup). Parsons’ Ave Maria seems clearly not to have been intended for use within the Roman rite, since he sets only the biblical greeting and omits the traditional ending in which Mary is asked to pray for sinners, reflecting the reformers’ belief in Jesus as man’s only mediator and advocate. What all the music here has in common is a tendency to move away from the more florid style of polyphony that characterised earlier Tudor church music to a one note per syllable system. That’s common not just to English music of the period; the Council of Trent enjoined a similar principle on composers for the Roman rite and paradoxically Byrd’s Great Service of music for Anglican use contains some music more elaborate than any of the works here. Emphatically, however, less florid does not mean less interesting. Magnificat, who have shown themselves to be ideal interpreters of the more elaborate style, are just at home with this plainer music; their performances are restrained and intimate without in any way under-valuing what they sing. This is one of three recent Linn releases which they have kindly provided for me in both SACD and 24/96 download format - both the CD and SACD 2.0 layers and the download sound excellent. An excellent release is made even more so by the first-rate notes from Sally Dunkley, who was responsible for editing the music here, and a further note from Philip Cave on pitch. Since I’ve criticised some of Linn’s recent cover shots, let me add that the one for this recording is particularly eye-catching. There are some minor niggles about the translations: ‘you … speak to us of the heavenly Light’ is not quite the same as lumen beatum prædicans - giving us a foretaste of the blessed light. Those very minor grumbles apart, this is another triumph for Magnificat and Linn.